It looks like the guys at Taito have got a thing for nostalgia, what with them springing both Bubble Bobble and Rainbow Islands upon the DS. Not that I have any issues with that at all, I grew up playing home conversions of Taito classics, but Rising Star's latest choice for the DS treatment is a game close to my heart. The New Zealand Story was an arcade game of 1988 vintage from Taito in their heyday. A conversion of the game found its way into a bundle for the Commodore Amiga home computer and thusly found its way into some 2 million homes, mine being one of them. It was my first experience of 16-bit gaming joy in the home and consequently I played it A LOT. You play as Tiki the kiwi and you were really quite happily living a relaxing life with all your friends in a zoo in Auckland, New Zealand when all of a sudden some huge leopard seal (with some kind of kiwi fetish maybe) bags up all your friends and whisks them off to his evil seal-ey fortress. You and you alone have got to find your way to his lair and set free your kiwi chums. Now Tiki isn't your average kiwi, he seems to have quite the arsenal of weapons available to him, starting off with a bow and arrow and going on to such things as lasers, bombs and wizards staffs. You'll need that weaponry though, because each level is packed full of bad guys, tricks and traps. Now a lot of older games have aged quite badly but TNZS comes from a golden era when games were positively packed with great ideas and fresh design, which allowed them to age gracefully. There are huge multidirectional scrolling levels, a wide variety of balloons to catch a ride on, with some balloons having distinct advantages over others. 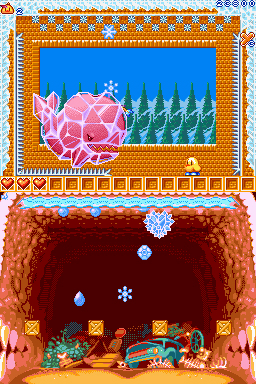 Then of course there's the wide variety of enemies trying to put a stop to your rescue mission. It's a title already packed with cool gameplay, so what are we going to see in this that justifies the tag New Zealand Story Revolution? Well, the graphics have been given a general overhaul, with the sprites being given a more colourful and shaded appearance than in the original. New gameplay elements have been added, such as the ability to aim where you shoot by pressing the shoulder buttons. You can also now flap your tiny wings a little when in a jump or falling to fly, but only a teeny tiny distance. Now, it wouldn't be a DS game if there wasn't a bit of touch screen gimmickry, so naturally some minigames have been added. Most of the time the lower screen just displays a map of new Zealand, telling you what level you're on but at certain points in a level, up pops a mini challenge, usually involving saving your little kiwi from some deadly trap or some other activity like going fishing. 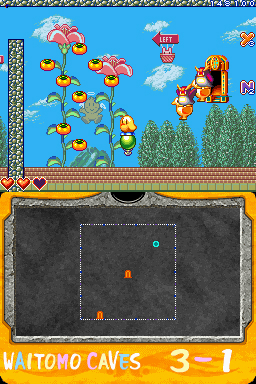 There is also a minigame that involves spotting the difference between your screen as you play on it, and a duplicate shown on the lower screen. Finding this difference can be quite a challenge when it could be anywhere over the distance of a few screens and the bad guys are STILL coming at you! These minigames are also accessible as multiplayer challenges, although there is no proper multiplayer mode for the quest itself. The New Zealand Story is a game that is going to appeal to youngins and the keen retro gamer. The game is a huge bundle of cute, and it's full of action. Old timers like myself will be able to relive our misspent youth, hum along with the theme tune and try to remember where the warp gates are. Currently, the game is being published by Rising Star games in Europe and has a release date of October 20th. There hasn't been a date for release in the US set as of yet but it surely won't be too far off. So, be prepared to hide from laser gun toting kiwis when passing your local zoo!